CBS This Morning with Gayle King and Charlie Rose, reviewed. Remember Sunday? Wasn’t Sunday Great? 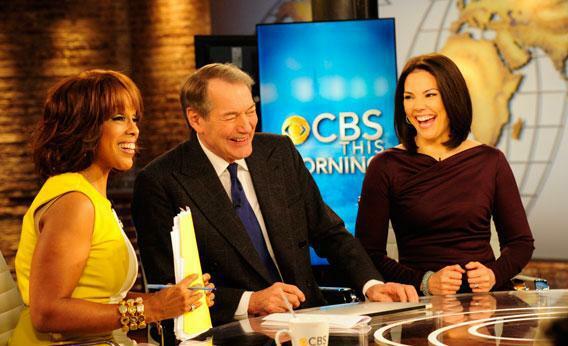 The new CBS This Morning, with Charlie Rose and Gayle King, traffics in nostalgia for yesteryear and yesterday. Gayle King, Charlie Rose, and Erica Hill on the set of CBS This Morning. Photograph by John P. Filo © 2012 CBS Broadcasting Inc. All rights reserved. CBS this morning introduced CBS This Morning (weekdays at 7 a.m. ET), its latest attempt not to croak at the cockcrow. For decades, NBC’s Today and ABC’s Good Morning America have eaten this network’s breakfast. Now, CBS is threatening to make itself useful by offering a product lacquered like hard news. Abandoning all hope of communing with the man or the Girl Scout troop on the street—as Today does at Rockefeller Plaza and GMA in Times Square—the new show comes to us from the “CBS Broadcast Center,” way west on 57th Street, where tourists fear to tread. The studio is big and open, with more exposed brick than the loft-office of a late-’’90s dot-com startup. One wall is heavy with shelves showcasing mementos from the network’s history. There’s a vintage TV set, some framed black-and-white photos, and a ribbon mic possibly once graced by the spittle of Harry Reasoner. The show seems primarily engaged in the stewardship of the CBS brand. Between the gewgaws and the graphics, you’re often sizing up three or four iterations of William Golden’s Eyemark at any given moment. Most notably, it is etched, or something, into the clear-topped round table at which its three hosts alertly perch. The traditional journalist among them is Erica Hill, who exudes calm command and has a great haircut. She left me with the impression that she had read the news, but I don’t think that actually happened. Instead, shortly after 7, the show caught us up on events with a segment called the “Eye Opener”—a 90-second montage of clips that reviewed the previous news cycle and teased the coming episode. There had been a debate in New Hampshire, a memorial ceremony in Tucson, a couple NFL playoff games, a bungee-cord mishap somewhere or other. … Scored with a tinkle and pulse suggesting a Coldplay cover of “Where the Streets Have No Name,” the bit had a soaring nostalgic cast to it, as if the idea were to get you pumped up to fondly recollect events that you hadn’t entirely collected yet. Remember Sunday? Wasn’t Sunday great? Back in the days when Newt Gingrich would squint maliciously at Mitt Romney? Hill is joined Charlie Rose, host of the eponymous late-night talk show, and by Gayle King, Oprah’s sidekick. Early on, Rose chatted via satellite with Bob Schieffer about insider chatter the night before up in Manchester, N.H. Schieffer allowed that he had gathered this intelligence early in the evening, “not towards the end of the evening, when everybody gets really smart,” and they shared a little chuckle, and you caught a glint of subtext. Two months ago, in the New York Times story anticipating the announcement of this makeover, reporter Brian Stetler referred to the eyebrows raised by This Morning’s inclusion of Rose, who is “ a mainstay on the Manhattan cocktail party circuit”—an epithetic euphemism admired all over town. But Rose was a pretty sight on Monday, and the tone of the show is one of mellow sobriety. There is no seeming danger that a cooking segment is going to break out, and there was no weatherman distributing canned sunshine. This is hardly to say that This Morning is wall-to-wall policy discussion and investigative reporting. I believe that if you borrowed 60 Minutes’ stopwatch you could demonstrate that, of the many stories the episode covered, it devoted the most time to moistly reporting on the fallout from Jodi Kantor’s reporting on the Obamas’ marriage and to celebrating the 30th birthday of Prince William’s wife. When Julianna Margulies—the star of CBS’s classiest drama—showed up, Charlie asked, “What’s happening this season?” and it seemed likely that he was asking because he has not seen the show and honestly wanted to know. Likewise, when Gayle asked Margulies who makes her character’s suits, there was real sincerity in the query. There’s a small glassed-in space in one corner of the This Morning studio that serves as a combination of a green room and a bullpen. From this holding area, the singer-songwriter Melissa Etheridge emerged to drop in as a special guest. If I understood correctly, Etheridge has no official affiliation with the show, but here she was, chatting about the parturition of Beyoncé’s baby from her perspective as a person in possession of one womb and two Grammys. That’s the tone here—authentic and adult contemporary and intimate with power. Good morning, and good luck.